We make Small Texas Dog Houses. We build these dog houses in our workshop. 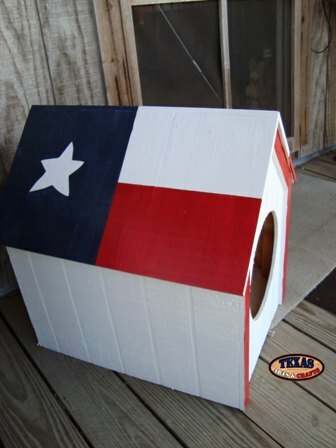 This dog house has a circular hole, and is painted white with the Texas flag on the roof. The size and decor may vary slightly as it is hand made. 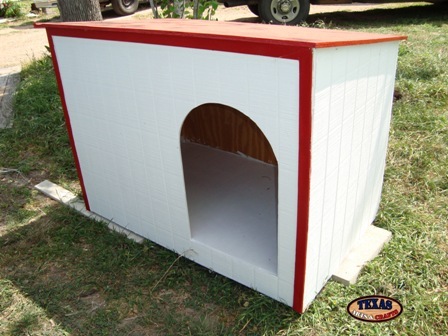 The dimensions for the small dog house are approximately 26 inches tall by 21.50 inches wide by 26.50 inches deep. 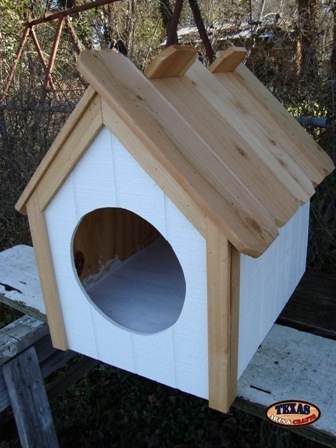 The dimensions for the medium dog house are approximately 36 inches tall by 27 inches wide by 34 inches deep. The dimensions for the Large dog house are approximately 45 inches tall by 33 inches wide by 37 inches deep. 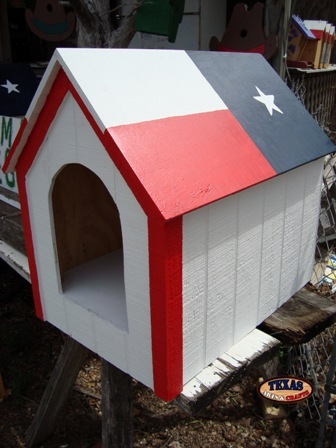 The dog house is a local item only and can be picked up from our store or at our crafts show. We make the Texas Dog House. We build these dog houses in our workshop. 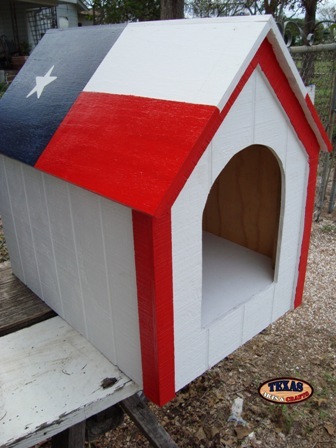 This dog house has a arch shaped hole, and is painted white with the Texas flag on the roof. The size and decor may vary slightly as it is hand made. We make the Arch Opening Picket Dog House. We build these dog houses in our workshop. This dog house has a arch shaped hole, and is painted white. The roof of the dog house is made out of pickets. The size and decor may vary slightly as it is hand made. We make the Green Trimmed Dog House. We build these dog houses in our workshop. 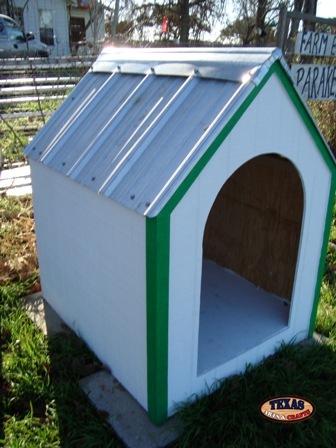 This dog house has a arch shaped hole, and is painted white with green trim. This dog house has a metal roof. The size and decor may vary slightly as it is hand made. We make the Red Roof Dog House. We build these dog houses in our workshop. 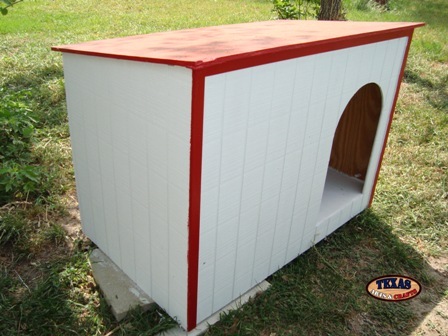 This dog house has a arch shaped hole, and is painted white with red trim and a red roof. The size and decor may vary slightly as it is hand made. We make the Round Opening Picket Dog House. We build these dog houses in our workshop. This dog house has a round shaped hole, and is painted white. This dog house has a picket roof. The size and decor may vary slightly as it is hand made. We build Extra Large dog houses in our workshop. This dog house has an arch shaped hole. 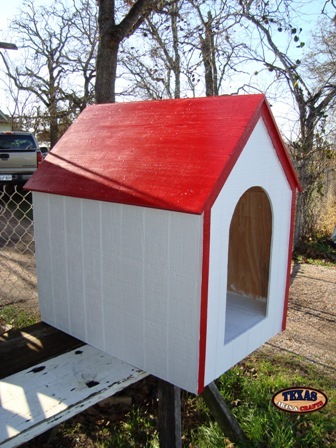 This dog house is painted white with red trim and a red roof. The size and decor may vary slightly as it is hand made. 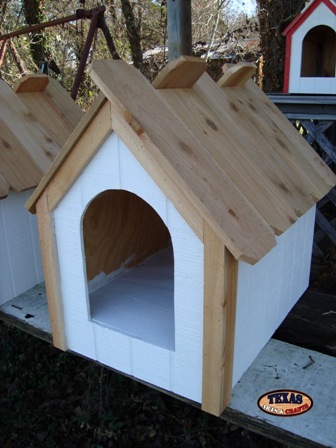 This dog house will be great for very large dogs such as Great Danes, Basset Hounds, German Shepherds, and Dalmatians. The dimensions for the Extra Large dog house are approximately inches tall by inches wide by inches deep. 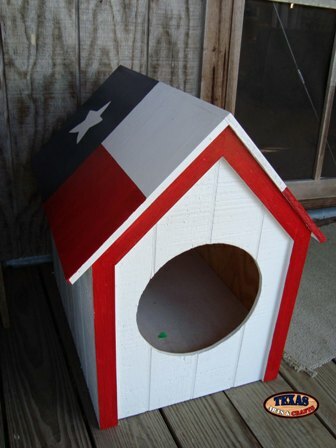 The dog house is a local item only and can be picked up from our store or at our crafts show.